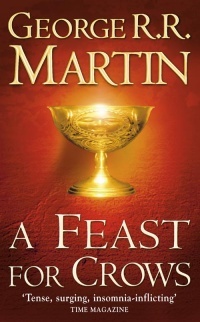 The fourth entry in the gargantuan A Song of Ice and Fire series, A Feast For Crows picks up immediately where the third volume A Storm of Swords ends, with the war in Westeros coming to a violent and horrifying end and new threats arising. AFFC – as I’ll mention it from now on – was so big that it was split into two halves, with the story being divided by geographic location and filled into the next volume A Dance of Dragons. So what did I make of A Feast For Crows? I’m going to liken it to an old car. She’s a gorgeous beast by all means but she’s not without her problems and she’s prone to stopping and starting. This is to say that AFFC will often take off hitting the ground running but then will stop to crawl very, very slowly. Some moments are exhilarating and get across the urgency of their chapters to me while other POV chapters will drag out something shocking and severe. It’s this stopping-and-starting effect in AFFC that frustrated me as a reader. George R. R. Martin is a fabulous writer and has a gift for drawing you into the worlds but it seems to me that a good chunk of this was him moving characters around to get them where he needed them to be for future instalments. For example, Brienne – a fabulous character, one that has grown to be one of my favourites, actually does a complete circle, in terms of geography, throughout the novel. A good chunk of this could be edited but for some odd reason it wasn’t and her journey doesn’t really offer anything at all. There’s not much of value in her journey this book, despite where she ends up and some lines of conversation throughout. Surprisingly enough, the real star of this entry is Cersei because she’s always fun when she’s frantically trying to remain in power. But even some of her chapters are just full of dialogue that adds little. It’s like putting a pair of fancy curtains in a room to liven it up. It’s certainly going to catch your eye but adds little to the story. I’m not saying I want glorious non-stop action. Political intrigue and world building is fine. What I am saying is that AFFC didn’t need to be this drawn out. It needed an edit here or there, with some POV chapters being able to be entirely removed. That being said, it’s never lacking in detail and it still has that magic – the reason why you fell in love with the first entry, A Game of Thrones. Being such a big book, there’s a lot of intriguing material here that sets up the next entry and even the events to come in the forthcoming The Winds of Winter so regardless of my problems with it, I enjoyed it and look forward to reading the next novels in the series that will wrap up these new conflicts.